We recommend either of the two coral acclimation methods explained below in addition to proper quarantine procedures and wish to remind you the acclimation process should never be rushed. 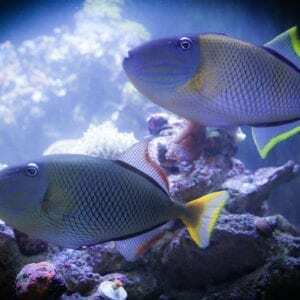 Also, remember to keep your aquarium lights off for at least four hours after the coral is introduced into the aquarium to help them further acclimate. We strongly recommend “dipping” your new coral(s) with coral RX or similar and or using a quarantine tank for 1-2 weeks. Aquarium lights should be turned off. Do not expose the coral to direct light. This may stress the coral resulting in trauma or death. Float the sealed bag in the aquarium for 15 to 20 minutes. Do not open the bag at this time. This will allow the water in the shipping bag to adjust slowly to the temperature in the aquarium while allowing for a high level of dissolved oxygen. After floating the sealed shipping bag for 15 to 20 minutes, cut open the bag towards the top of the bag and roll the top edge of the bag down one inch to create an air pocket within the lip of the bag. This will enable the bag to float on the surface of the water. For heavier pieces of live coral that will not float, place the bag containing the coral in a plastic bowl or container. Add 1/4 cup of aquarium water to the shipping bag. Keep adding ¼ cup of aquarium water every 5 minutes until bag is full. Lift the bag from the aquarium and discard half the water from the bag into an empty container. Repeat steps 5 through 7 one more time. 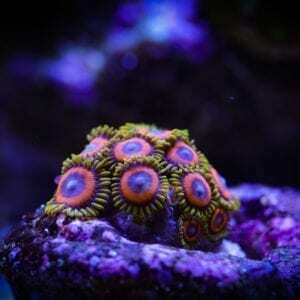 Carefully place coral at the bottom of your aquarium to allow for lighting acclimation. Important: Never release shipping water directly into the aquarium. Items Needed: Air tubing, 3-5 gallon bucket, Air control valve (may also tie tubing into knots). Follow steps 1-3 of the floating method to acclimate temperature. Carefully empty the contents of the bags (including the water) into appropriately sized buckets. Try not to expose any part of the coral to the air. Depending on the amount of water in each bag, you may need to tilt the bucket and or a prop or wedge to help hold the bucket in this position until there is enough water in the bucket to put it back to a level position. Using airline tubing, set up and run a siphon drip line from the main aquarium to each bucket. You’ll need separate airline tubing for each bucket used. Tie several loose knots in the airline tubing, or use a plastic air control valve. Begin a siphon by sucking on the end of the airline tubing you’ll be placing into each of the buckets. When water begins flowing through the tubing, adjust the drip (by tightening one of the knots or adjusting the control valve) to a rate of about 2-4 drips per second. Place a small heater into the bucket or monitor the temperature closely. Depending on the species of coral the drip acclimation procedure can last anywhere from 45 minutes to well over 2 hours. A good rule of thumb is to let the water volume in the bucket fill up. Then remove half of the water and discard. Let the bucket fill up again. The coral can now be gently transferred to the bottom of the aquarium. Do not touch any of the coral’s tissue. Thank you for shopping with Funky Monkey Coral. If you have any questions, please email us at sales@funkymonkeycorals.com. During most days (standard business hours) we will usually respond within a few hours.